Anti Aging Tonic(VIVIX) vs. High Blood Pressure I have high blood pressure that is controlled by a diuretic and beta blocker combination medication. Usually even with medication my systolic ranges between 129-138 and my diastolic between 75-83 and my pulse would range anywhere from 80-91 (rarely dropping below 80). After five days on Vivix™ my blood pressure was 111/69 and pulse 59. 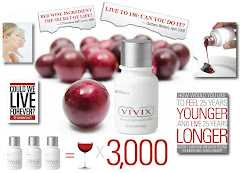 The only thing different that I have been doing prior to this low reading is Vivix™. The past few days, my bp seems to be consistently around 122/73 and pulse 70. That’s pretty pleasing to me. I hope to eventually be able to come off all medications. I do supplement with magnesium and CoQ10 to counteract what my bp medication causes in nutrient deficiencies, but I’d rather not have the stuff going through my system. I have not been on any other medications, not changed my diet any and my exercise level is still around 7500 steps a day.